French: Vergerette à feuilles segmentées. Type: NW USA: Idaho, "On the banks of the Kooskoosky", leg. Lewis (PH) holotype. Erigeron compositus var. glabratus Macoun, 2: 231. 1884. Erigeron compositus Pursh var. multifidus (Rydberg) J.F.Macbr. and Payson, Amer. Midl. Naturalist, 1: 402. 1900. E. gormanii Greene, Pittonia 4: 156. 1900. Vegetative morphology. Plants (4–)8–15(–20) cm high; perennial herbs; caespitose. Taproot present, or only fibrous roots present (fibrous brown roots developed off a caudex). Ground level or underground stems vertical. Caudex present (branching from a stout vertical taproot). Aerial stems erect. Leaves heterophyllous (when bract leaves are considered), or not heterophyllous (basal leaves); mainly basal; erect (or spreading); alternate; marcescent. Petioles present, or absent; 8–25 mm long; hairy; pilose (with tiny glandular hairs between the longer hairs). Petiole hairs longer than the diameter of the petiole; erect; straight, or wavy (long hairs multicellular with 1–2 cells). Leaf blades compound (a contrast with other Arctic species). Blades 2–8 mm long, 3–15 mm wide, spreading, with inconspicuous veins. Blade adaxial surface with sessile glands (tiny, seen at 40×, if present) or without sessile glands, hairy, hairs villous (coarsely), hairs simple, hairs sparse, hairs white, or translucent. Blade abaxial surface hairy, hairs villous, hairs sparse, hairs white, hairs curved, hairs appressed or spreading or erect. Blade margins deeply divided (towards the apex), with non-glandular hairs; apices acute (somewhat, lobed 2–4 times at the ends into linear segments). Reproductive morphology. Flowering stems with leaves (usually with a small bract leaf). Flowering stems hairy. Flowering stems villous (hairs breaking at joints). 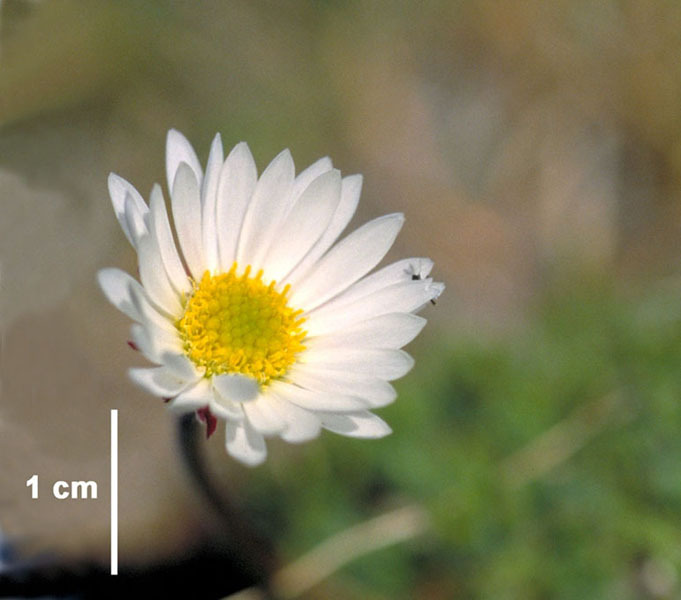 Flowering stem hairs simple; shorter than the diameter of the flowering stem; white or translucent. Inflorescences solitary heads; terminal. Flowering heads 10–16 mm deep; 20–25 mm wide; with disc and ray florets. Involucral bracts present. Number of rows 1–2. Outer involucral bracts mostly green, or mostly wine red or purple pigmented; lying adjacent to the flowers; linear, or lanceolate (narrowly); 8–10 mm high; 0.9–2.2 mm wide; densely hairy; without glandular hairs. Inner involucral bracts lanceolate; 6.5–7.5 mm high (including the attenuate tips); 1–1.5 mm wide; margins narrow and scarious, less than one quarter of the bract. Flowers radially symmetrical (actinomorphic) (disc florets), or bilaterally symmetrical (zygomorphic) (ray florets); unisexual, or bisexual. Sepals represented by a pappus. Pappus with a single row of hairs. Ray florets pappus 2.8–3.2 mm long (pappus hairs with stiff divisions pointing upwards). Disc florets pappus 3.3–3.6 mm long. Petals conventional; fused; 5; white, or pink (towards pale lilac); 5.5–6 mm long. Corolla tubular, or funnel-form (disc florets), or flat, strap-like (ray florets); 5-lobed (disc florets). Ray florets 30–40; limb 12–16 mm long; limb 0.5–1 mm wide. Stamens present, or absent; 5. Anthers 1–1.5 mm long. Ovary inferior; carpels 2; syncarpous. Styles 1; 3–3.5 mm long. Stigmas per ovary 2. Placentation basal. Ovules per ovary 1. Fruit sessile; with calyx persisting; dry; cypselas; indehiscent. Seeds 1. Chromosome information. 2n = 18, or 35, or 36, or 54, or 63. 2n (7x) = 63. Böcher and Larsen (1950, Greenland); Jørgensen et al. (1958, Greenland). Ploidy levels recorded 6x, and 7x. North American distribution. Alaska, Yukon, Northwest Territories Islands, continental Northwest Territories, Nunavut Islands, continental Nunavut. Arctic islands: Baffin, Devon, Ellesmere, Axel Heiberg, Parry islands (Bathurst, Prince Patrick), Banks, Victoria, Somerset (Prince of Wales). Northern hemisphere distribution. Amphi-Beringian (mainly), or North American. West Chukotka, Wrangel Island, East Chukotka, West Alaska, North Alaska  Yukon, Central Canada, Labrador  Hudson Bay, Ellesmere Land  Peary Land, West Greenland, East Greenland. General notes. Noyes et al. (1995) stated that E. compositus is an agamospermous species complex comprising sexual and agamospermous elements in which five subspecies had been informally proposed for sexual E. compositus: "articus," "compositus," "pectinipetiolatus," "penicillatus," and "posticus." The study by Noyes et al. (1995) reported chromosome counts that showed sexual E. compositus is predominantly diploid, 2n = 18. Sexual tetraploids, 2n = 36, and an aneuploid, 2n = 35, were also observed. Genetic variation was examined in all of the proposed subspecies, with the exception of E. compositus "anticus," and in closely related E. vagus. The four proposed subspecies investigated have very similar allozymes, with a mean genetic identity value (I) of 0.847. 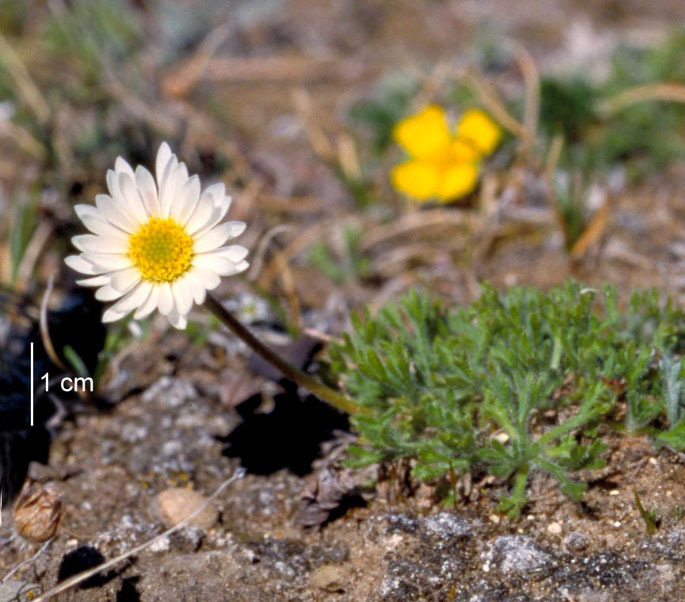 Likewise, comparisons between populations of E. vagus and E. compositus yield an I value of 0.889. Fixation indices derived from allozyme data also showed that sexual E. compositus and E. vagus are strongly outcrossing. Allozyme markers, genetic similarity values, and patterns of morphological variation suggest that sexual tetraploid E. compositus is derived from a cross between diploid E. compositus "compositus" and one or more of the sexual "subspecies" of E. compositus. These results represent the first phase in the chromosomal and genetic analysis of the E. compositus agamospermous complex. 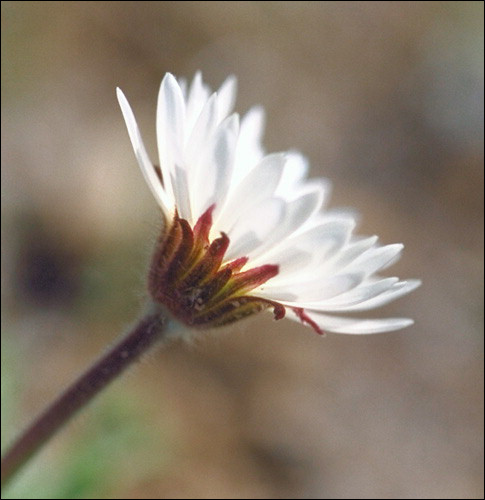 Noyes and Soltis (1996, p. 1292) noted "Erigeron compositus occurs in montane western North America and comprises both sexual and agamospermous populations. Sexual E. compositus had previously been characterised as outcrossing and predominantly diploid (2n = 18). Agamic E. compositus is usually hexaploid (2n = 54), though counts herein range from 2n = 36 to 2n = 80. Starch-gel electrophoresis, cytology, and analysis of pollen production were used to evaluate variation within and among agamospermous populations. Fifteen enzyme loci were used to identify 24 unique multilocus genotypes in seven populations, an average of 3.4 genotypes per population. Proportion of distinct genotypes per population sample size (G/N) and measures of genetic diversity (D) and evenness (E) were 0.10, 0.48, and 0.61, respectively, which indicate that E. compositus maintains levels of diversity similar to other agamospermous taxa. Most agamospermous populations are mosaics comprising groups of genetically distinct individuals that are frequently distinguished by cytotype and capacity for pollen production. The geographical and ecological separation of sexual and agamospermous populations make it unlikely that gene flow from sexual populations is a direct source of genetic variation in agamospermous populations. Instead, crossing between genetically distinct facultative agamosperms probably accounts for most variation. Genetic and morphological evidence documented one such putative crossing event. Agamospermous E. compositus is very similar genetically to sexual E. compositus. Allozyme analysis further shows that genetic variation in agamospermous populations is partitioned among a few highly heterozygous genotypes, whereas sexual populations maintain numerous genotypes of relatively low heterozygosity." Illustrations. • Habitat. 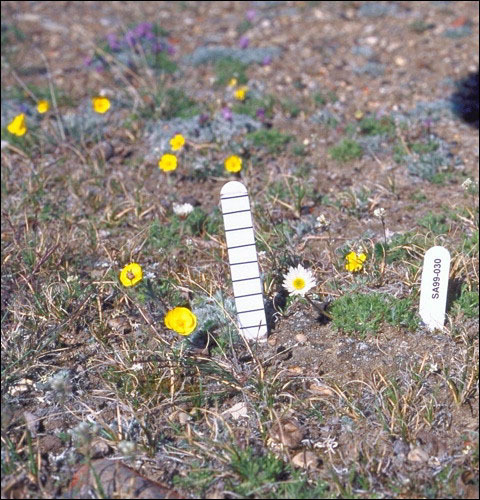 Plant with white flowering head and pinnately divided leaves, between the markers. Yellow flowers are Potentilla. N.W.T., Banks Island, Aulavik National Park. Aiken 99–030. CAN. Scale bar in cm. • Close-up of bud. 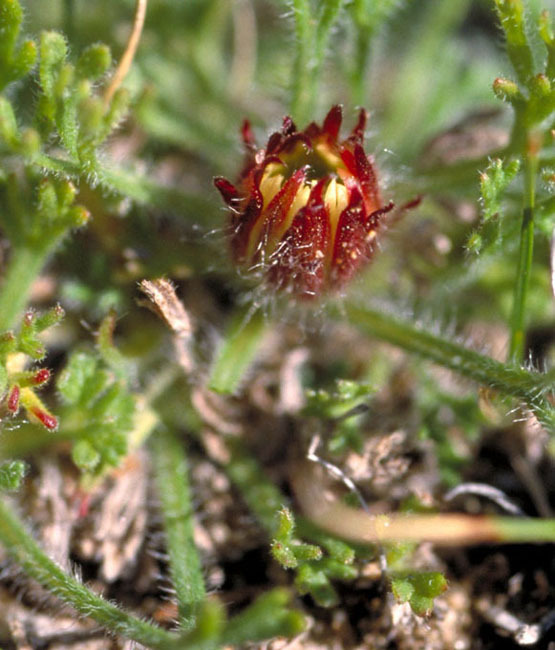 Note dark reddish, moderately hairy, outer involucral bracts and finely divided leaves. N.W.T., Banks Island, Thomsen River. 9 July, 1999. Aiken 99–038. CAN. • Close-up of opening bud. Flowering head with red, hairy involucral bracts spreading to show cream coloured ray petals. Note long hairs on the pinnately divided leaves. N.W.T., Banks Island, Thomsen River. 9 July, 1999. Aiken 99–038. CAN. • Surface view of flower. Flowering head with long white ray petals and yellow disc florets. Ellesmere Island, Slidre Fiord. July, 1988. S. Cumbaa. No voucher. • Close-up of plant. Plant with white flowering head and pinnately divided leaves. N.W.T., Banks Island, Aulavik National Park. Aiken 99–030. CAN. • Close-up of flower. Flowering head with white ray petals and yellow petals of the disc florets. The outer ones have opened while the inner ones are in bud. N.W.T., Banks Island, Thomsen River. 9 July, 1999. Aiken 99–030. CAN. • Side view of flower. 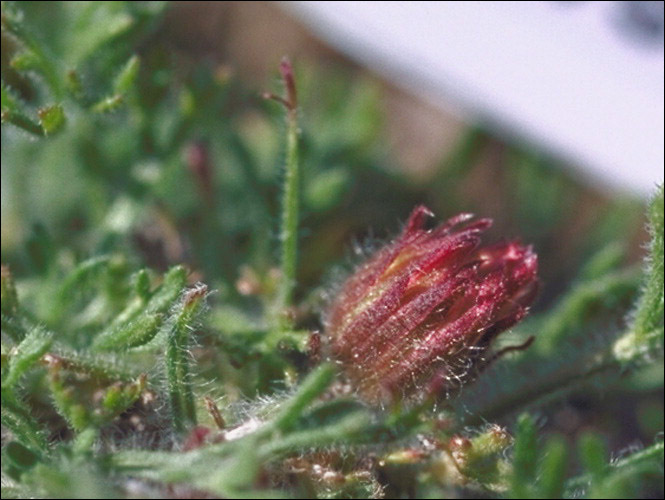 Side view of flowering head showing involucral bracts in which the outer whorl is greenish red and the inner whorl is more red with narrow and scarious margins. N.W.T., Banks Island, Thomsen River. 9 July, 1999. Aiken 99–030. CAN. • Arctic Island Distribution.